When you sit shoulder-to-shoulder with any man for two straight days, you learn a lot about him without even trying too hard. But spend two days with a man who carries life-long injuries incurred in battle and you will learn more than you would ever imagine about yourself and the freedom you enjoy. Long before sunrise on the first day there is a lot of excitement among the combat-wounded veterans invited to take part in this special deer hunt. (Photo: Richard Simms)Led by the folks with the Tennessee Wildlife Resources Agency and the Tennessee Valley Chapter of Safari Club International, twenty-five lucky guides got to do just that. 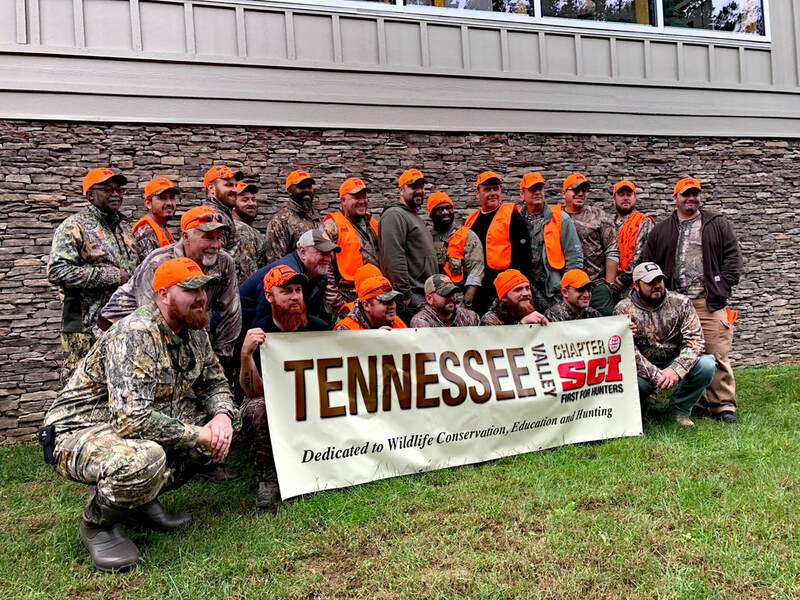 We spent two days this week, each of us in the company of a combat-wounded veteran, on a special deer hunt at the Enterprise South Nature Park. WILDLIFE ON WHEELS TRAILER IS TRAVELING! A long time dream of Tennessee Valley SCI members, the Wildlife on Wheels trailer was finished and ready for travel early 2014. With schools starting we are excited about the many request we are receiving to bring the trailer for exhibit. Inside there are mounts, and other educational materials so children from all over the Tennessee valley will have the opportunity to experience wildlife hands on. The trailer can travel to your school or event (within a 50 mile radius of Chattanooga) courtesy of TNSCI and there is no charge to your organization. Outside of a 50 mile radius there will be a small fee for gas. A leading member of our organization will be there to explain the wonders of wildlife to your group. Click below to Schedule the trailer to come to your school or event. This Howa rifle in "Ghost American Flag" is chambered in the popular 6.5 Creedmore and comes with a scope. The drawing will be held during our March 23rd banquet. Tickets are available now from all board members. $40 at the banquet will get you 2 tickets for this rifle plus a SCI National and Chapter membership. Regular memberships outside this event are $65. ​This is a deal you can't pass up! Purple Heart "Hunts for Warriors"
TN Valley SCI was a founding supporter of the Str8 Shooters Clay Team several years ago and continues to support youth shotgun and archery sports with this presentation. SCI board member Keith Watson caught up with some of the team and coaches to present a check during their first practice of 2018 at Dead Zero Shooting Park. Chapter President Mike McDowell presents a check to Kirk Miles, Wildlife Program Manager for Tennessee Wildlife Resources Agency to be used for projects at Johnson Bottoms Wildlife Management Area. This check will be matched with Federal Pittman Robertson funds for much needed repairs and enhancements on the WMA. Pictured left to right are SCI Treasurer Chris Willmore, Mike McDowell, Kirk Miles, TWRA Johnson Bottoms WMA Land Manager Jason Jackson, Tennessee Fish and Wildlife Commissioner and SCI director Tony Sanders, and SCI director Keith Watson. Ben Layton, TWRA Region III Biologist accepts a cellular trail camera. This tool will be used in our region in conservation efforts that benefit all hunters. Ben was also recognized at the 2017 banquet as the TWRA employee of the year for his outstanding contributions to conservation and community service. Pictured left to right are SCI Treasurer Chris Willmore, Ben Layton, SCI President Mike McDowell, and SCI Secretary Taylor Massingill.